Windows 10 makes it easy for the users to configure Windows Firewall by using pre-defined configurations of Windows Firewall. By default, there are three network types on which Windows Firewall configurations are used, public, private and domain. Windows gives users an option to select a network type when a new network is connected to the computer. Windows will set the Windows Firewall rules according to the network type selected. Lets first know more about each network type. 2 What is the current network type of your computer? A public network is the default network type. 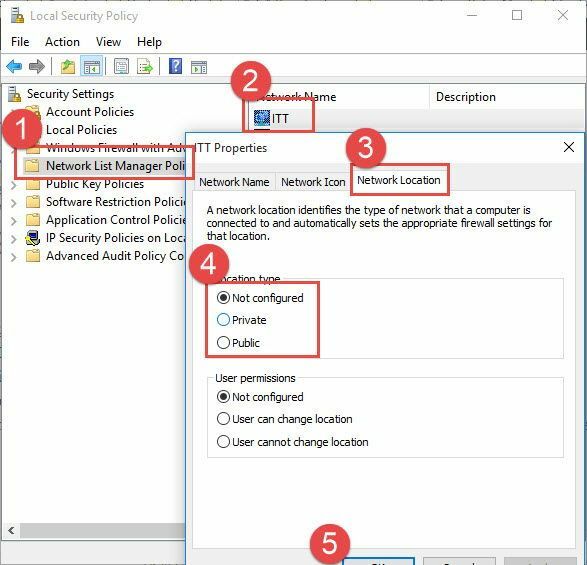 If no network type is selected, Windows will configure Windows Firewall using the Public network type rules. In public network, Windows Firewall rules will be the most restrictive. The firewall will block most of the apps from connecting from the Internet and disabling some features like file and printer sharing, network discovery and automatic setup of network devices etc. You should use this type of network when you have only one computer and do not want to communicate with any other network device. The private network can be a home network or work network. This type of network will enable most networking features of Windows 10 like file sharing, network device setup, network discovery etc. Use this network type if you trust the network you are connecting to. The domain network is automatically detected when your computer is a member of Active Directory domain network. Windows should automatically detect this type of network and configure Windows Firewall accordingly. This type of network gives more control to the network administrator and the admin can apply different network security configurations using Active Directory group policies. In this article, we will be more interested in changing the network type from public to private and vice versa as the domain network is automatically detected by Windows 10 and we don’t need to change anything. What is the current network type of your computer? 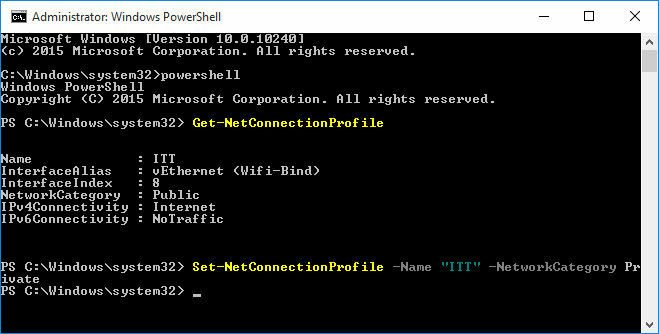 Let’s go through a few methods to change the network type in Windows 10. Click on Change Network Location link. This will open a charms dialog asking you “Do you want to allow your PC to be discoverable by other PCs and devices on this network”. Press the Yes button if you want your network to be set to Home or Work and No button if you want to be in public network. 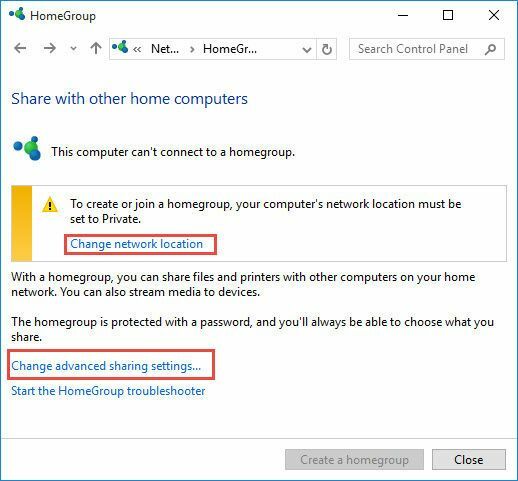 You can configure each type of these networks in more detail by clicking on the link “Change advanced sharing settings…”. If you are an advanced user and are comfortable with editing Windows Registry, this method will be easier for you to change the network type especially when you want it to be done on multiple PCs using just a single registry file. Under the Profiles key, you will find some sub-keys with different GUIDs. This corresponds to the no. of network cards you’re using with your computer. Select each sub-key of the Profiles and look for the ProfileName key in the right hand pane. This will give you the name of the network so that you can easily recognize which network you want to change. After identifying the right sub-key, you can change the Category DWORD value in the right hand pane to change the network type of that particular network. Value data can be 0 for Public network, 1 for Private network and 2 for Domain network. Select Network List Manager Policies. This will list all the networks in the right hand pane. Double click your desired network, go to Network Location tab. Change the Network location type to either Not configured, private or public. If you want to do this for all the connected networks, you can double click All Networks instead of your desired network. This will change the network type immediately. However I wonder if you have written about, or know of, the mechanism by which Win10 uses to determine the Network Type.. I know the simple answer is DNS and NLS but.. like I really want to know the sequential events that occur with the aim being to try and understand what scenarios tend to make Windows believe it’s on a Private or Public network when in actuality, it is on the domain. Domain network: If the computer is connected to a domain and the network information also matches that of domain network, it is detected as a domain network. These are very basic principles. Microsoft may have some other complete detection rules but the basics remain the same. Oh my god thank you so damn much! I’ve had the problem of VPN virtual network adapters being Private by default when I install a new version of the software or on a new computer and it seems Windows continues to move around or remove the option to change it to Public so I can set my Windows Firewall rules to block access to my torrent program in the case of my VPN dropping and the connection defaulting to my non-VPN private wifi connection. Seems easy enough but just now, once again, I can’t find any of the old ways to change it back to Public!!! The one link it shows me does nothing when I click on it, yet it works for my native hardware adapter. So weird. Anyway, the PowerShell method changed it IMMEDIATELY! Love it. Now my hair can regrow! Oh, thank you so much. I have just spent 3 hours googling and trying to find out from Microsoft (worthless) how to change from my Public Network (still don’t know why it was set up this way) to Private Network. I updated the Registry and BAM! I am in business. Took all of 5 minutes. You are a Heavens’ sent. updating the registry option worked best for me , it sounded daunting but was straight forward to do in the end , thanks itechtics !! Hi Thanks, Powershell solved the problem. After trying numerous ideas that are only applicable to that win 10 version and not mine on the net. It is hard to believe how hard Microsoft have made this, as I am running the latest Win 10 Home latest version updates. 10 March 2018.
lifetime Windows user until two years ago when due to work had to switch to macOS… Came back to Win 10 for a home project.. I’ve no idea how I managed to keep my sanity for all these years before going mac…. Great article, but absolutely useless if I can’t print it out and take it with me. secpol.msc did the trick with OpenVPN public network. Thank you a lot. The links “change network location” does not show up on my two Windows 10 laptops. This same information is all over the Internet. If this is an issue on a domain, where the sharing indicates it is NOT using domain, sharing, then probably also the network shows as “not identified” instead of the domain name. If so, then try going to IPV4 properties, advanced, DNS suffix and add your FQDN.